The project location was an active hotel in the very crowded and congested Union Square area of San Francisco, with no available street parking. Work hours were restricted due to the fact that the hotel was fully operational at the time. To further complicate matters, there was no access to the roof and all materials had to be carried through a narrow service stairwell, then a 200 stair climb to get to the point of entry. From there, an extension ladder had to be lowered 20 feet into a sunken well where the skylights were assembled. There were two areas specified for new skylights which were replacing very old existing wire glass assemblies that were leaking due to deteriorated glazing. The largest skylight was over an active kitchen which required interior scaffolding and plastic tarps set up to protect the prep area. Two smaller ones were over the Elks Lodge on the opposite side of the building which required them to first load materials up the stairwell and bring it through a narrow upper roof to get to the location above the work site. In order for the workers to access the site, they had to crawl through a three-foot hole in the kitchen because no materials could be brought through. Frames had to be built on the higher roof and then lowered to the small roof below. 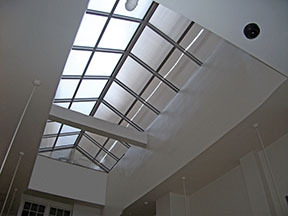 Wasco’s Horizon S-Series polycarbonate skylight system was chosen over glass because it is lightweight, impact resistant, UV protected and, most of all, easy to install. 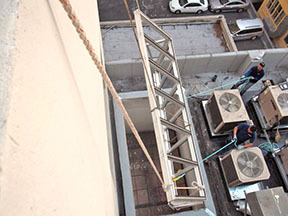 Installation time and labor costs were reduced, which was critical given the numerous challenges posed by the extreme work location and restricted time frame. 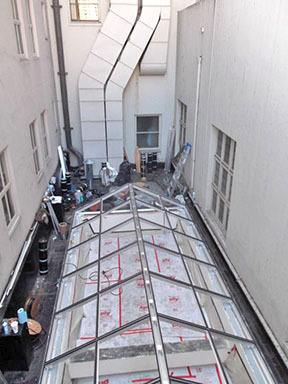 The large skylight was a 32’ x 13’ double pitch, Horizon polycarbonate with a 6:12 pitch utilizing a Pinnacle 350 framing system. The two smaller ones were 13.5’ x 7.5’ with a 6:12 pitch. “The Wasco’s sales representative was extremely helpful. Once the order was placed, all of the shop drawings were executed to exact specifications and delivery was right on time. 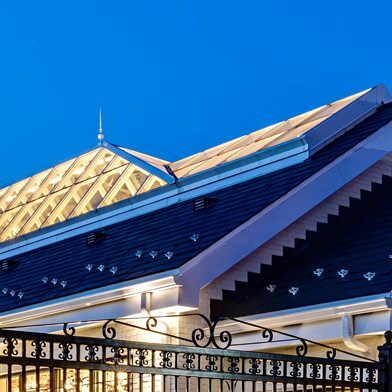 This was critical because of both the compromised time schedule and, with the rainy season fast approaching, any slight hiccup could have been a nightmare.” said Matt Malin from Fidelity Roof Company. The roofs also had to be replaced. They had six layers of tar and gravel which required exacting measurements to cut the corners around the opening in order to get accurate curb dimensions. Any mistake would be a serious problem given the difficult circumstances on the construction site.